"Our mentoring focuses on coaching students to think and work like engineers or scientists, and how to become a valued member of a team," said Lisa Hunter, director of the institute. Hunter and Jerome Shaw, emeritus associate professor of education, accepted the award during a ceremony in Washington, D.C. Awardees receive a $10,000 award, a commemorative certificate, and invitations to participate in meetings with STEM education, research, and policy leaders. Based in the Division of Social Sciences, the Institute for Scientist & Engineer Educators (ISEE) prepares scientists and engineers at the undergraduate, graduate, and professional levels to be effective and inclusive, with an emphasis on teaching, mentoring, and collaboration. 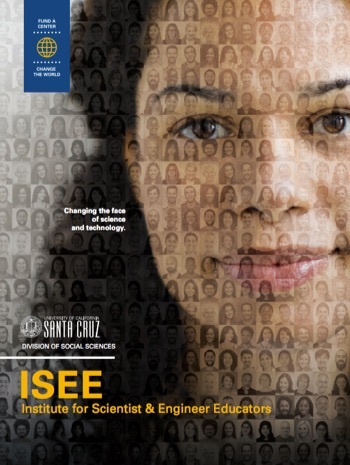 ISEE offers programs at UC Santa Cruz, as well as at universities across the country. The institute received the award for its work developing a local science and engineering workforce for observatories on Hawaii’s Mauna Kea and Haleakala summits. ISEE's Akamai Internship Program offers intensive training in problem solving and communications skills that are highly valued by employers, said Hunter. “Local workforce development is crucial to the success of telescopes in Hawaii, and mentoring is one of the most effective ways to bring young people into the workforce," said Hunter. ISEE is the legacy of the Center for Adaptive Optics (CfAO) at UC Santa Cruz, where the Akamai Program was developed along with programs that train future faculty members to be inclusive educators and mentors. With hundreds of ISEE alumni working in professions across the country, the institute is poised to expand its influence through a national network of chapters, said Hunter. In addition to the Division of Social Sciences, the institute receives support from the Physical and Biological Sciences Division, the Baskin School of Engineering, the Division of Graduate Studies, and the University of California Observatories. External funders include the National Science Foundation, the Air Force Office of Scientific Research, the Thirty Meter Telescope International Observatory (TIO), the Daniel K. Inouye Solar Telescope, and the Hawaii Community Foundation. The PAESMEM awards program is administered by the National Science Foundation on behalf of the White House Office of Science Technology and Policy.